The Canadian Grand Prix promised a lot, yet delivered even more. There was drama from the first corner of the first lap, until the first corner of the last lap. Reliability was the watchword of the day as the Circuit Gilles Villeneuve proved ultimate test for teams who very recently believed they had conquered early season problems. 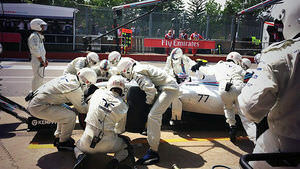 Mercedes were hit with a rare appearance of mechanical problems, while Red Bull were hit with a rare showing of pace. Further back drivers were falling off the track left and right and following their highs of two weeks ago Marussia came down to earth with crash. This race had it all. Welcome one, welcome all. It is race day in Canada and thanks to a brilliant qualifying session yesterday this is surely one you won't want to miss. The focus this afternoon is mainly on positions one and two as the Mercedes pair do battle for race victory. Rosberg scored a brilliant pole position yesterday which makes it his race to lose. Hamilton in second will be looking to make amends for a disappointing Monaco. On the second row, Vettel must surely be targeting a podium position, but he has two very fast Williams cars behind him, both of whom should have outqualified the Red Bull yesterday. The FIA are pre-empting problems with teams pushing fuel flow limits. Charlie Whiting released this timely reminder this morning. Gene Haas is in attendance this afternoon. He's still convinced he can run a successful F1 team from the US, I wonder if anything he learns here will change his mind? Adrian Newey who earlier announced he's stepping back from the sport at some point in the future, talks to Martin Brundle on the grid. "I had a great time in Formula 1, it's time to try some different things"
He'll be involved in developing next year's Red Bull car, but probably not much beyond that. On the grid Kobayashi takes a five place (which in reality is one place given how far back he qualified) grid drop for a gearbox change, while Gutiérrez starts from the pitlane after trashing his motor yesterday. For reference, here's the grid in full. Magnussen sounds upbeat, given that he is starting from 12th. "It's gonna be a race where many people are on different strategies." Pat Fry says everyone will require some fuel saving today. How many, if any, safety cars appear will be the key to how much saving is ultimately required. Seven drivers will start on the yellow soft tyre. Hülkenberg in 11th is the first to select them. Behind him Kvyat, Maldonado, Chilton, Bianchi, Ericsson and Gutiérrez all make the same choice. Rosberg heads the pack once around the circuit for the formation lap. Tweet from @OfficialSF1Team "Radio check, learn all gears"
Rosberg rounds the final corner and backs up the pack before finding his place on the grid. It was a slow out lap as all drivers are concerned about saving fuel. Race start. The Canadian GP is underway. Hamilton has a brilliant start, but Rosberg squeezes him off the track. Bianchi is facing the wrong way. Looks like a big one. Safety car is out. Chilton was the other car involved in that incident. 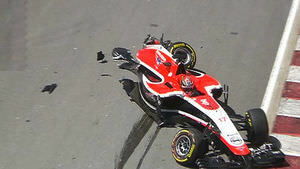 Disaster for Marussia! Replays show Chilton got out of shape into the first chicane and wiped out his team mate. Gutiérrez took the appearance of the safety car as a cue to make a pitstop. Swapping the yellow soft tyre for a set of red super softs. This early safety car will help the borderline fuel saving. Vettel is on the radio to inform his team and the FIA that the marshals doing clean up have missed a bit. This could be a long safety car period. Fastest lap so far was set by... Kamui Kobayashi on lap five. You don't see that every day. At the front of the field, the first corner shuffling between Rosberg and Hamilton has let Vettel sneak into second position, with Lewis managing to prevent Bottas from stealing another spot from him. The track is now clear in sector three but the safety car remains leading the field. Safety car is coming in at the end of this lap. Everyone makes it through the chicane unscathed this time. Caterham have asked Marcus Ericsson to retire his car. Kvyat spins at turn one all on his own. Hamilton makes a move on Vettel with the aid of a little DRS on the back straight. He sets off down the road in pursuit of his teammate. Turn 4 incident involving Max Chilton and Jules Bianchi will be investigated after the race - causing a collision. Unsighted by the TV cameras, Grosjean makes a stop and heads out on the yellow soft tyres. Ericsson's problem that caused his retirement was apparently related to his Renault power unit. Ricciardo pits as both he and Bottas complain of rear graining. Bottas and Button pit. Both favouring the yellow soft tyres. Button is harassing Gutiérrez, finally gets the job done on the back straight. Fernando makes his stop and just manages to exit ahead of Vergne in the Toro Rosso. Alonso needs to get his tyres up to temperature as JEV breathes down his neck. Massa passes Kvyat and moves into 12th after he lost out badly in the pitstops. Rosberg pits from the lead. Nico had enough of a gap to ensure he keeps the lead but almost loses it at the chicane on his out lap! Will he lose too much time? Rosberg has enough in hand as Hamilton had a slower than expected stop. A chance to catch your breath then as most of the stops have been completed. Both Force India's are currently running in third and fourth as they've yet to make a stop. Familiar territory for the Silverstone outfit. Kvyat's really struggling on his tyres, he is yet to make a stop and having trouble keeping the car on track. Fastest lap for Hamilton, he puts in an impressive 1:19.561. Maldonado's Lotus sounds unwell, he enters the pitlane at reduced pace. The Force India's are wrecking Vettel's strategy this afternoon. He needs them to pit soon. Up front the gap between the Mercedes' is reduced to a car's length and Hamilton cranks up the pressure. Yellow flag. Kobayashi's day is over. He pulls to the side of the track with what looks like a broken rear left suspension. Hamilton pressures Rosberg off the track at the final chicane, will the German need to surrender that place? Rosberg managed to set the fastest lap with that off track excursion. Felipe Massa passes Fernando Alonso as the pair cross the start/finish line. Incident involving Nico Rosberg under investigation - track limits. Tweet from @ClubForce: Tyre management masterclass - both Nico and Checo are setting their fastest laps of the day on 26-lap-old tyres! Sutil is on the radio asking if he can pass Gutiérrez, he is given permission to make the pass. Sutil and Gutiérrez make the swap. Hamilton again has reduced the gap after Nico gained an advantage by cutting the chicane. Game on at the front. Sebastian Vettel is having to play defensive as Valtteri Bottas ducks left and right behind him, looking for an opportunity. If Force India keep going like this, they could do the whole race on one set of rubber. Amazingly Pérez has got this far on a set of super soft tyres. Rosberg is told over the radio to save fuel. He says he has a front vibration too. Nico Rosberg has been given a final warning for cutting the chicane, but no penalty. The raging fight at the front is unmissable stuff. Which is a shame because I could do with a pitstop of my own. Eek. Oddly Hamilton has dropped back slightly on that lap. Given Rosberg's troubles that is surprising. Sergio Pérez makes his first, and presumably only, stop of the day. He comes back out in 11th. 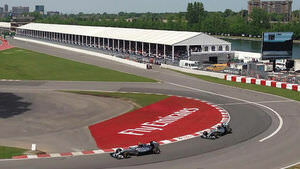 Here's a view of the epic Mercedes battle as seen by Pamela at the track. The two men at the front both complain of no power! You couldn't make this up, the frontrunners both look visibly slower on track. Of the pair, Rosberg is losing more time than Hamilton. The second Mercedes is bearing down on the first, despite struggling for pace. Yellow flags for Räikkönen who spins it at turn 10. Track is clear after Kimi gets it together again. Hülkenberg makes his stop and returns to the track on red super softs. The Force India driver is now in 8th. The earlier safety car clearly helped the fuel situation. Ricciardo is told not to save fuel at this point. "Both cars have the same problem. We don't think we can solve it. You need to pick the pace up." Rosberg makes his second stop of the day, Hamilton takes the lead and has a clear track in front of him. It is a slow stop from Mercedes as the front left tyre didn't play ball. 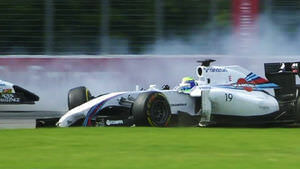 Felipe Massa leads the Grand Prix. Crucially Hamilton jumped Rosberg in those stops. Lewis makes a mistake at the hairpin on cold tyres and Rosberg sneaks through. Disaster! Lewis Hamilton is returning to the pits slowly. Unclear exactly what the problem is. It is game over for Hamilton, he makes it to the pits but the team push him into the garage. Massa now pits from the lead. He returns to the track in 6th place, sadly unable to make it to the end on that set of tyres. Kvyat's car pulls to a halt at the hairpin. Sergio Pérez in second is hunting down the remaining Mercedes, closely followed by Ricciardo and Vettel. Tweet from @PTalevska: Grandstand is erupting. So much going on. Electric! It now comes down to who has the tyres to fight at the end. Four drivers in with a shot at the win, with 15 laps remaining. Somehow Rosberg puts in his fastest first sector of the race, trying his best to pull a gap over the threatening Pérez. Felipe is on the radio asking for team orders to get him in front of Bottas. He doesn't want team orders, he does want team orders. Make up your mind chap. It all goes wrong for Williams as Bottas gets the hurry up message and attempts a pass on Hülkenberg at the hairpin. Massa takes the opportunity and sneaks past the pair. Massa with reasonably new tyres sets about chasing down the four guys up front. Alonso passes Bottas at turn 1 for 7th. Does the Finn have a problem in that Williams? Team radio to Räikkönen: "Be careful of the tyres we still have 10 laps to go." Grosjean's day is done (news to me that he was even in this race) as he pulls into the pitlane and retires. That's the eighth of the day. Massa is getting racey in 5th, can he make a move on Vettel down the long straight? Not this time. Amazingly the Williams driver can see 1st place ahead, from where he sits in 5th. Drama! Tweet from @Lotus_F1Team: Romain retires. Damage to rear wing. To be investigated. Pérez is struggling for brakes and Ricciardo seizes the opportunity passing the Force India into turn one. The second Red Bull has designs on that third place occupied by Sergio. Gutiérrez says enough is enough and retires to the pitlane. Three laps to go for Ricciardo to challenge for his first ever F1 race win. Ricciardo takes the lead of the Canadian Grand Prix! He passes Nico in the DRS zone. 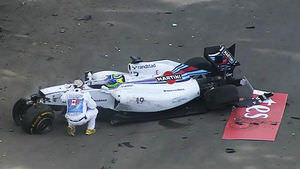 Massive smash for Massa and Pérez over the start/finish line. Looks like Sergio and Massa are both okay. Daniel Ricciardo wins the Canadian Grand Prix! Oh my goodness that was exhausting. Replays show that Vettel passed Pérez before the final chicane. Pérez then braked earlier than Massa into the first corner and the Williams driver had nowhere to go, smashing into the Force India's left rear. The two cars spun each side of Vettel, somehow missing him before hitting the wall. Vettel comes over to hug Ricciardo as they exit their cars. The Australian anthem rings out to chants of Ric-ciar-do from the crowd. There were a total of eleven retirements today (including Massa and Pérez who were technically still classified) in Montreal, a proper car breaker this one. Ricciardo on the podium: "The race really came to life the last 15 to 20 laps, we saw Rosberg was slow on the straights. I was really struggling to get past Pérez, they had a pretty good car down the straight. We finally made a nice move into turn 1. "A couple of laps to go I just found myself in the right spot to get DRS. It's an amazing feeling right now." Rosberg on the podium: "It was a big battle all the way. I didn't have the best get away, I managed to stay ahead until I had a problem at the second pitstop. I dropped behind as a result. "I didn't really know what was going on, because I lost a lot of power, I was just trying to hang on. It didn't really work out against Daniel." Vettel on the podium: "Congratulations to [Daniel], it is his day. the race came to us, a big help from Mercedes unlike other weekends. We were there to capitalise. 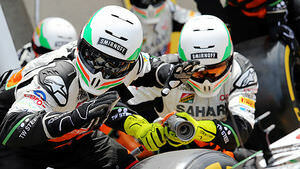 "It was difficult for us being stuck behind the Force India's. We lacked power so it didn't help our strategy. It is a very positive day, Daniel's first win here and a first win for Renault in this new era of engines. They had a very good comeback." That concludes Sidepodcast's live text coverage of the Canadian GP. It was a brilliant afternoon of action that absolutely delivered on the expectations set in qualifying. Thank you for reading and see you in two weeks time.